GUEST BLOG /By Joyell Nevins and Mindy Flanary—In San Diego, on historic North Park's busiest corner sits Encontro, a restaurant geared towards open air and easy conversation. 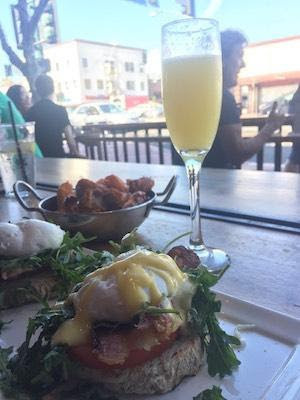 A mimosa or French-pressed coffee does the trick while watching people walk by at their indoor-outdoor seating. You can also eat inside at the long wooden tables, sit at the bar facing a wall of plants, or grab a stool and watch the chefs at work. According to its website, the name "Encontro" comes from the verb "encontrar," meaning to "meet, find or discover." We discovered a wide variety of unlikely yet delicious combinations, like brussel sprouts with bacon and capers or cheddar bratwurst with smoked paprika hollandaise. The menu is an eclectic mix of craft food and fresh greens, almost all offered with one of these homemade aiolis: basil, Worcestershire and sriracha (be warned -- that last one's got a kick). Some of our favorite items came off of their "go withs" list: the aforementioned brussel sprouts, crispy potatoes with pickled fresno aioli (called patatas bravas), and fried chicken sliders with coleslaw. Anything with applewood bacon also gets our vote - it was thick and sweet and full of flavor. The brunch menu includes several benedict choices, however, we found their hollandaise sauce to be heavy on the butter. Lunch and dinner offers plenty of gourmet burgers, American staples like pork chops and mac 'n cheese, salads, and even a fried chicken and waffle option. One of their draws is the bottomless mimosas, offered all day. Other drink specials throughout the week include a flip night -- guess the toss of the coin correctly and your drink's a dollar, or a date night where bottles of wine are buy one, get one for 10 cents. Local touches include regional craft beer and Hammond's ice cream. Try a churro milkshake or have a scoop a la mode with the cinnamon French toast (served with fresh berries and powdered sugar). 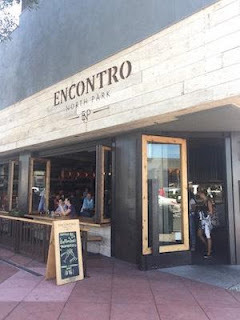 Encontro's patio is open to dogs, and their menu features an appropriately named "Dog Menu" with items like "Hot Diggity Dog, "Mutt Melt," and a "Bow Wow Bowl." And these meals come in specific doggie dishware. Encontro's wait staff is friendly, but service is not speedy. Be prepared to sit a while and enjoy your meal - this is not an in-and-out restaurant. We definitely found it worth the wait. 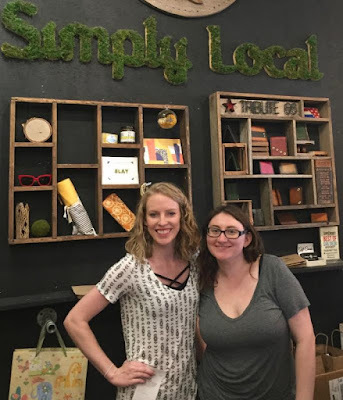 After your Encontro meal, go to Simply Local, two storefronts east. 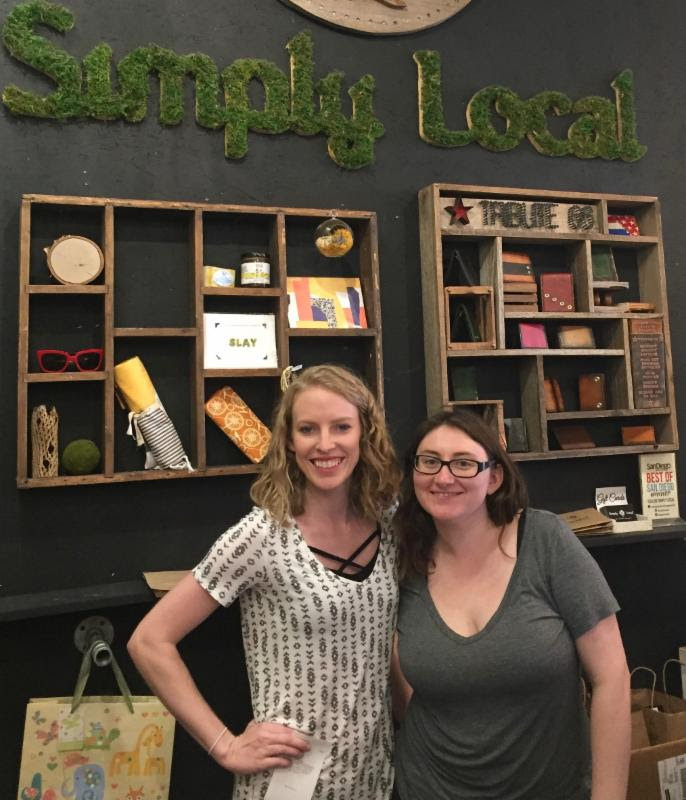 It's a merchant marketplace featuring more than 55 locally owned businesses and charities in San Diego. You can buy clothes, jewelry, flavored honey, body products, and home items. Plus, fair trade choices, North Park-based coffee roasters, soy candles, organic lotions, and a whole selection of regional T-shirts. Want a tote? Want a mug? How about a wooden plaque with a celebrity mugshot? They've got that, too. its debut the current issue of North Park News. --Mindy Flanary is an eight-year resident of North Park with a career as a government contractor supporting the Navy. As part of her job, she travels the world and gets to enjoy restaurants and culture from various locales. --Joyell Nevins has been a journalist for more than a decade in print and online media. 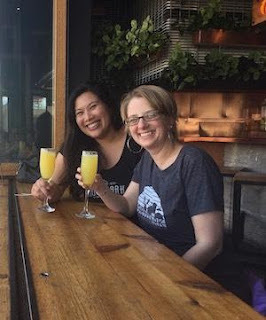 She is new to San Diego and appreciates the vibrancy and quirkiness of mid-city neighborhoods.